This week has been a madhouse for me personally, so getting the things that needed to get for the website took a bit of a backseat. As such, I was way behind the eight ball when it came to getting up my next match poster for the Cincinnati Saints’ NPSL match posters. Normally, I try to publish them at least three days ahead of time; this week’s game is tonight and I’m just now publishing. Yikes. Anyway, the Saints welcome Erie Admirals FC Commodores FC to town tonight for their fourth home match of the NPSL season. As such, I thought a nautical theme would be in order for the match poster this week, given that Erie’s crest and name focus on the same. 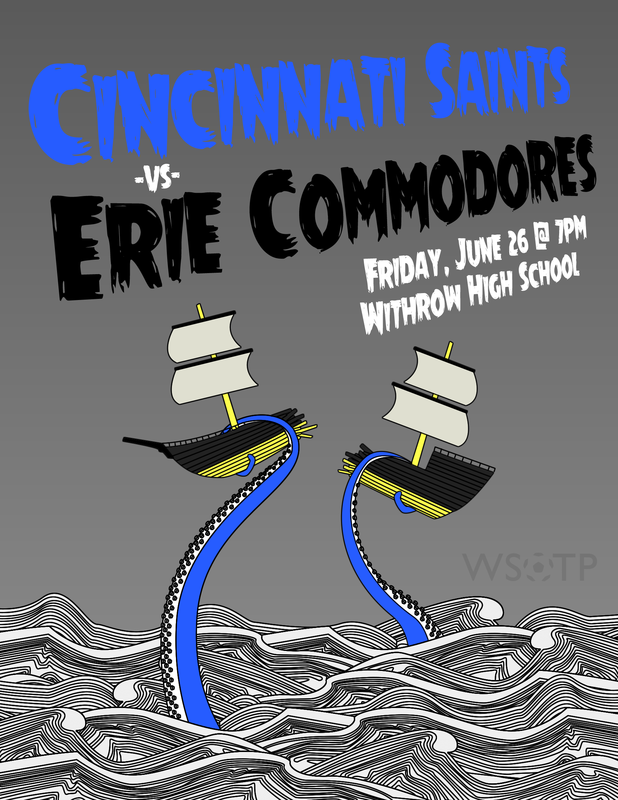 And I thought there would be no better way to capture the mood for the match than to have the Cincinnati Saints be the “sea monster” to Erie’s ship. Those of you familiar with the Kraken Black Spiced rum commercial will see the inspiration with the design that I utilized this time around. We here at WSOTP will once again be bringing you the live match commentary on the Saints live stream of the match, plus on ICRC local access television. So if you’re not willing to brave the rainy forecast, or you want to watch this split screen with the USWNT tonight, check out our Match Commentary page for links to the stream. If you want to see all the designs from my season long series, click here.